I was sent a lovely Patak's hamper with which to host a curry night. It had plenty of curry sauces, curry pastes, poppadoms and naan bread in it. I took on one of the recipes from Patak's - the Apricot Chicken - Indian Style (Khubani Murgh) and I think it came out just right and it got a big thumbs up too! Heat the oil in a pan, crackle cumin seeds for 1 minute and add chopped onions and cook on a medium heat until the onions are soft and golden brown in colour. 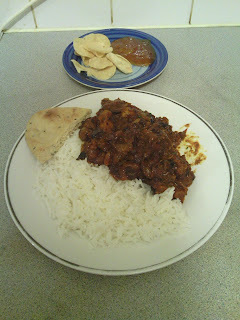 Add the Patak's Balti Paste and 100ml water and cook on simmer until all the water has evaporated. Add diced chicken and apricot and cook on high heat until the chicken is seared and add chopped tomatoes and the rest of the water. Cook on medium heat until the chicken is cooked. Stir in the cream and sugar. Check the seasoning and add salt if necessary. Garnish with the fresh coriander and serve with rice and naan bread. Like the difficulty rating, I would have to agree that this was a very easy to make recipe. It's a definite recommendation if you love a curry, but on't like it too hot. It helps if you're a fan of apricots too as it's a very noticeable and dominant part of the recipe.